What has USB, a Delta-Sigma oversampling DAC, integrated circuits, an old school tube, and MOSFET output drive? I call it a Mongrel, because it’s got a bit of everything in it. The project started during a holiday that included Tokyo’s Akihabara district, in particular a visit to Yodobashi – 9 floors of consumer paradise! Name a product and they have a whole department for it. The only problem was my tiny suitcase, even a pair of headphones was too bulky but a cabinet full of valves caught my eye. 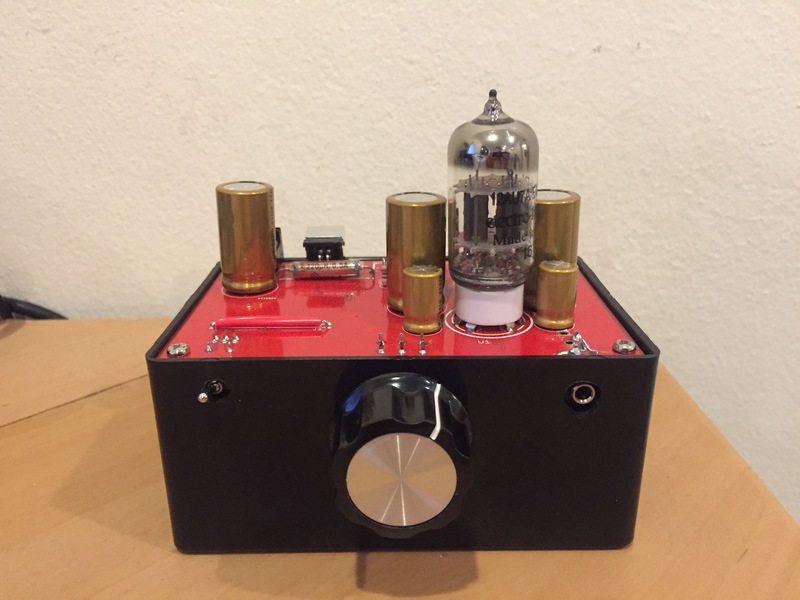 Some quick research turned up a suitable headphone amplifier I could build around a 12AU7 tube. I bought some of the quaint little glass trinkets and carefully carried them home. Driving my HD600 headphones, it’s a case of 15 watts of power in for 1mW of audio out, or 0.006% efficiency. But what a glorious milliwatt it is! (possibly biased, since I made it). I’m very happy with it for a first pass. It’s fun seeing the valve heaters glowing and knowing that a steady stream of electrons are leaping across a vacuum in order to give me music. As far as harmonic distortion goes, it behaves like a SET amp should with moderate amounts of low order harmonics. Tube aficionados say that low order, even harmonics give a warmer sound, and a MOSFET in single-ended mode will do much the same thing. But the tube looks nicer! The amount of harmonic distortion in the Mongrel rises with volume, from 0.2% at low levels to 0.5% at moderate levels (where I typically listen) and to 1.2% at loud levels. It’s mostly 2nd order, fulfilling the tubey-goodness requirement. There is some high frequency hash above 10kHz, it’s too quiet to hear on high impedance headphones but using low impledance headphones it can be heard with just the power supply connected. SET amps have no power supply rejection at all so the cause is the switch-mode PSU (I tried a second one, it was even worse!). A capacitance multiplier will be added in the next version which will drop the PSU noise by at least 60dB, it should be inaudible then! This entry was posted in Uncategorized on March 7, 2018 by geoff.